1. Grammar and vocabulary for IELTS graphs with a future trend. 2. Example sentences based on a graph. Here I will need to use the future tense, passive, language of trends and comparisons. Note: This task is not an official Cambridge task, I have simplified it for practice purposes only. Example sentences based on this chart. 1. In Japan, from 2025 to 2035, the production of cars is set to decline sharply. 2. It is predicted that by 2030 in China, car production will have increased. 3. From 2025 onwards, the number of cars made in Japan is expected to show a similar trend to that of the USA. 4. The number of cars that will be manufactured is likely to drop drastically in the USA by 2035. 5. There is expected to be a gradual increase in car production in China after 2020. 6. Car production in the UK is anticipated to see a sharp decline in the years from 2025 to 2035. Here is the graph again. Fill in the Gaps using the words below. 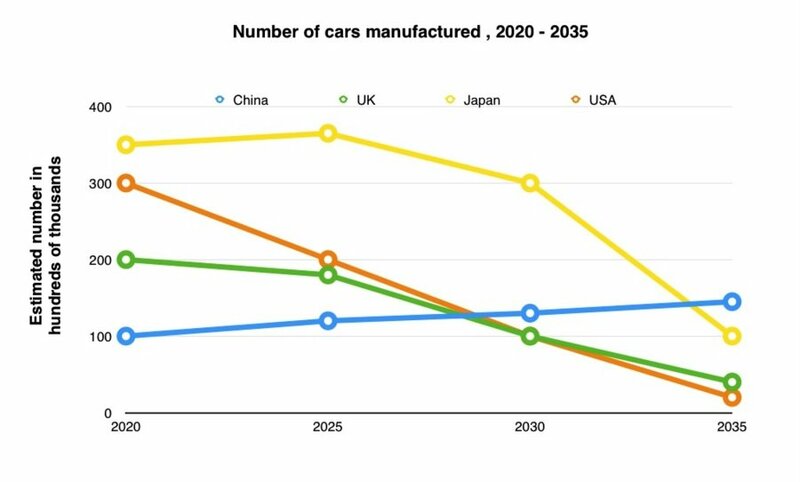 The graph shows the ________ _______ ___ cars that _____ ____ manufactured from 2020 to 2035 in hundreds of thousands in Japan, the UK, the USA and China. Overall, Japan, the UK and the USA show _______ that the number of cars manufactured is ___ ___ decline _____ by the end of the period. China ____ _____ _____ ____, indicates that there _____ ____ __ _____ ____ in car production over the whole period. By 2035, car manufacturing in the USA __ _______ ___ drop __________ from 300,000 to ____ ____ a few thousand cars manufactured. The UK is also ______ ____ ______ ____ ____ and shows a _______ _______ in the number of cars that ____ ____ produced. Japan, which indicates it ____ ___ the leading car maker in 2020 at 350,000 cars, is ___ ____ show a ______ ______ in production by 2025, but then a ______ _______ where production is _______ to fall to around 100,000 . On the other hand, China is ______ __ ______ a gradual increase in car production over the whole period. __ __ _______ ____ production ___ ___ __ 100,000 in 2020 and by 2030 it _____ _____ surpassed the other three countries, _____ ___ around 150,000 vehicles by 2035. The graph shows the estimated number of cars that will be manufactured from 2020 to 2035 in hundreds of thousands in Japan, the UK, the USA and China. Overall, Japan, the UK and the USA show predictions that the number of cars manufactured is set to decline sharply by the end of the period. China on the other hand, indicates that there will be a gradual increase in car production over the whole period. By 2035, car manufacturing in the USA is expected to drop dramatically from 300,000 to just over a few thousand cars manufactured. The UK is also anticipated to follow this trend and shows a considerable decline in the number of cars that will be produced. Japan, which indicates it will be the leading car maker in 2020 at 350,000 cars, is set to show a slight increase in production by 2025, but then a marked drop where production is predicted to fall to around 100,000 . On the other hand, China is predicted to show a gradual increase in car production over the whole period. 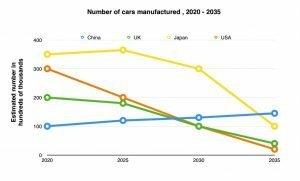 It is estimated that production will be at 100,000 in 2020 and by 2030 it will have surpassed the other three countries, ending at around 150,000 vehicles by 2035. This is for practice purposes only, it is not an official Cambridge task. Any questions? , leave a comment below.